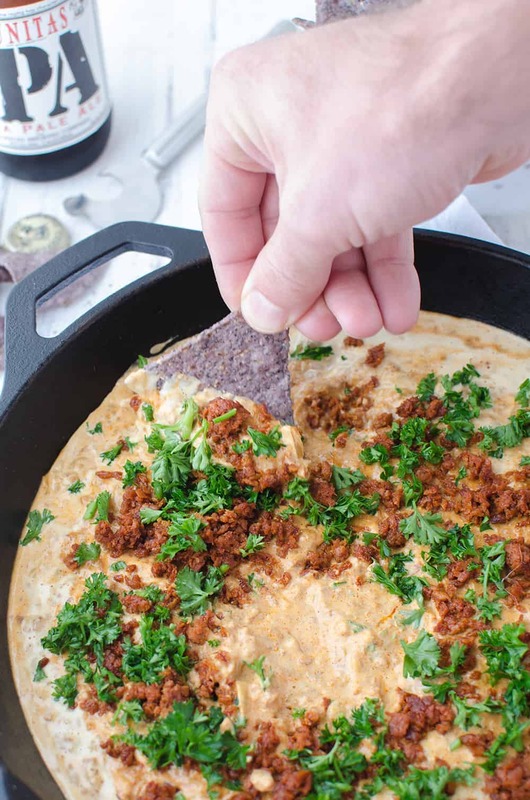 Another skillet filled with cheesy, dairy-free dip that’s so incredible I promise eyes will widen when you tell them there isn’t a lick of cheese included. If you enjoyed my chili cheese dip, then think of this one as its meatier, spicier, slightly fancier cousin. It’s still got all the necessary components: cashew cheese dip base, spicy meaty stir-in, but this time we are swapping cheddar for pepperjack and black beans for chorizo. Because we can. Have you ever tried soyrizo before? I know, I know, it’s a mock-meat, but honestly, it’s one of my favorites. I buy it on occasion to add flair to tacos, chilis and now- this dip. Spicy, smoky, it pairs perfectly with the homemade pepper jack cheese sauce. I’ve had cheesy dip on the brain since September. I really do have to restrain myself not to make chili cheese dip every football weekend because, control. I do have to say, though, that planning a menu and having fun snacks around the house make football season so much more enjoyable. I’ve never been the girl who loves watching sports. Believe me, I’ve tried. I want to be the wife who gets excited for all the football, basketball, and baseball watching that goes on in our living room, but I just don’t get it. I’m much happier in the kitchen, serving up fun food that I can then enjoy with BL. He’s watching the game, I’m editing photos or favoriting everything on etsy. Either way, we are both together on the couch enjoying some serious game-day grub. I have no idea what our plans are for the upcoming weekend (I’ve been told there’s a big game), but I’m sure it will involve a few friends, pitchers of margaritas, and an endless buffet of snacks, sandwiches, and dips. Because, Superbowl. A sports holiday I can actually get into thanks its commercials, halftime show, and emphasis on food. Totally cliche? You bet. But, it’s true. To help me get into the planning mode, I’ve started a Healthy Superbowl board on pinterest. As more and more snacks get posted this week, you can bet I’ll be adding more ideas to the list. If you’re looking for must-make snacks, in addition to this dip, make sure to head there. To my fellow bloggers, wanna add your favorite recipes? Send me a note, and I’ll add you to the group board. This dip starts like all of my cheesy dips, with cashews. I did try and come up with a different base, but they all tasted slightly off. Not the rich, creamy texture that I wanted- and which the cashew is famous for. To round out the dip, we add in a generous amount of spices: yellow bell pepper to tame any cashew flavor, nutritional yeast for a cheesy taste, and both green chilis and crushed red pepper for some heat. Since the chorizo is already well-seasoned, we are just going to heat it in a skillet with a little caramelized onion. 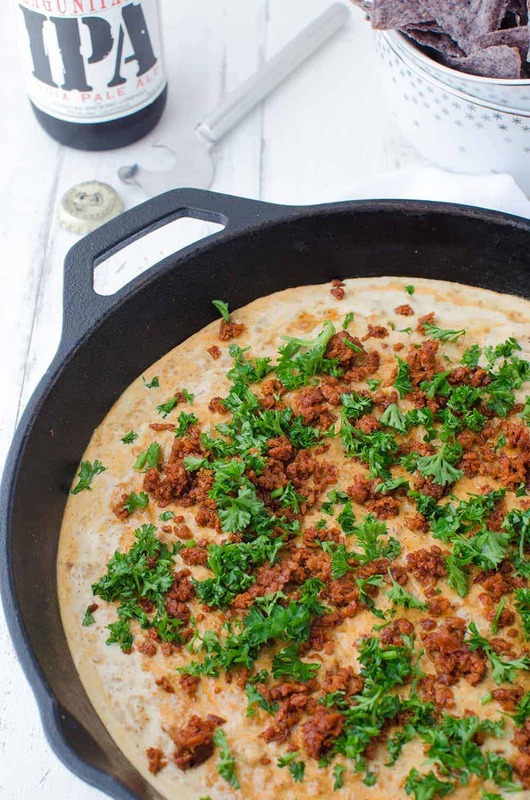 As it cooks, break up the chorizo with a wooden spoon so that it resembles crumbles and not large chunks. I ended up using about 1 cup of the chorizo mixture because I like my dip really saucy! If you want it a little heartier, feel free to add more. Like I mentioned earlier, the leftovers shouldn’t be a problem! Fold them into tacos, sloppy joes, chili, really, anything. Garnish with lots of fresh parsley (or cilantro if you swing that way) and dig in. 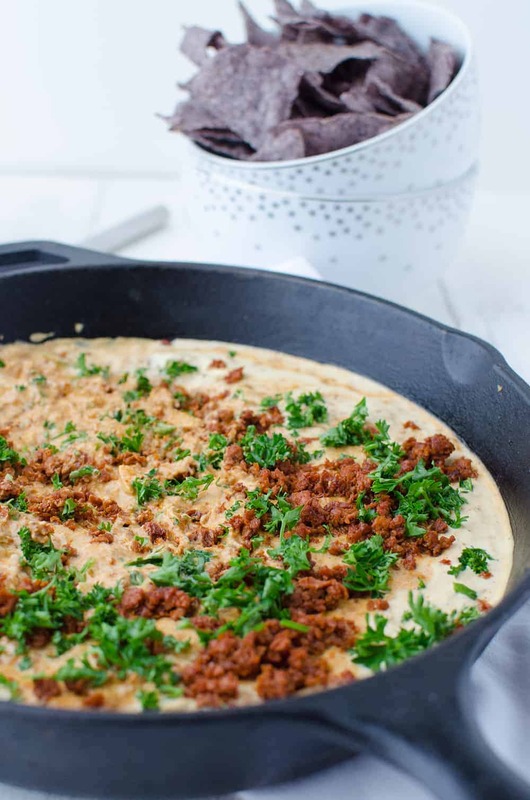 Cheesy Chorizo Dip! Vegan and Gluten Free. 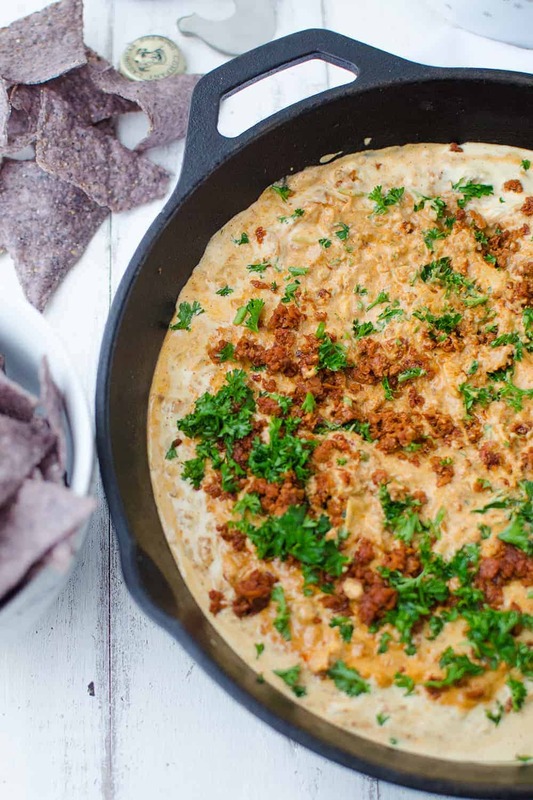 This is one dip you will wanna make again and again. 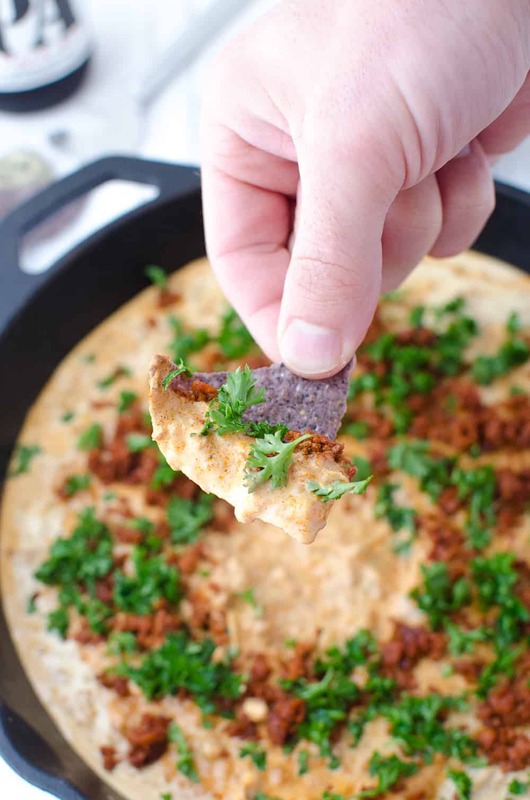 Pepper Jack Cheese Dip with spicy meatless chorizo and fresh parsley. Heat olive oil in a medium skillet over medium high heat. Add the chopped onion and saute for a few minutes until soft and lightly browned. In a large blender, add the cashews, water, lemon juice, yellow pepper, nutritional yeast, garlic powder, salt, and red pepper. Puree until very smooth, about 3-4 minutes. Add the the green chilis and cooked onions, pulse a few times to combine. In the same pan you used for the onions, crumble the chorizo and cook until browned and crispy, about 5 minutes. In a serving dish, pour in the pepper cheese sauce and stir in 1 cup of the chorizo mixture. You can add more if you’d like, but start with 1 cup and see. You don’t want the dip to be too thick. 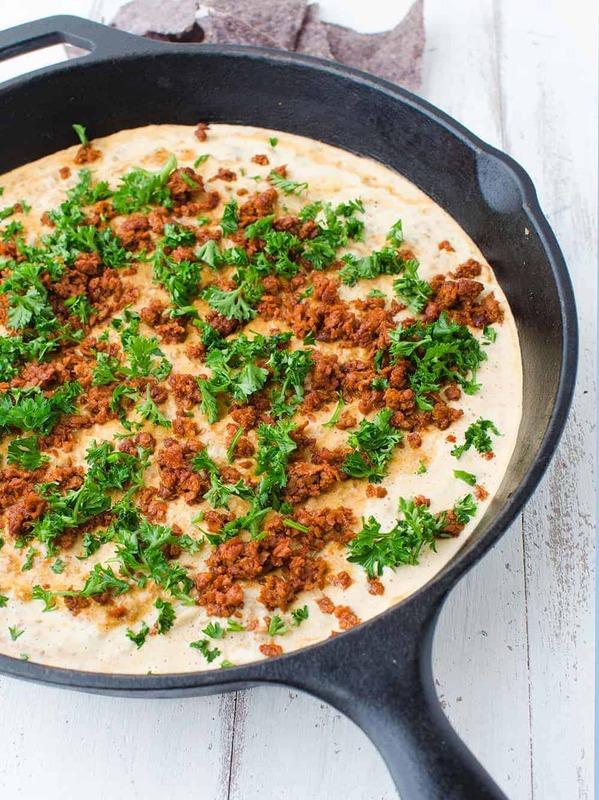 Use the leftover chorizo in tacos, chilis, or scrambles. Perfect for pita chips, tortilla chips, crostini, veggie slices- you name it! I swear most meat eaters couldnt tell the soy chorizo from TJ’s from real chorizo. This reminds me I still need to make the chili cheese dip- would be perfect for Super Bowl Sunday! Love it! Just showing how we vegans rock it! Stunning photos! OH my goodness…And I LOVE how healthy you made a not-so-healthy-but-extremely-delicious meal! Pinnins and trying this asap! This is so sinful but I must make it! Thanks! 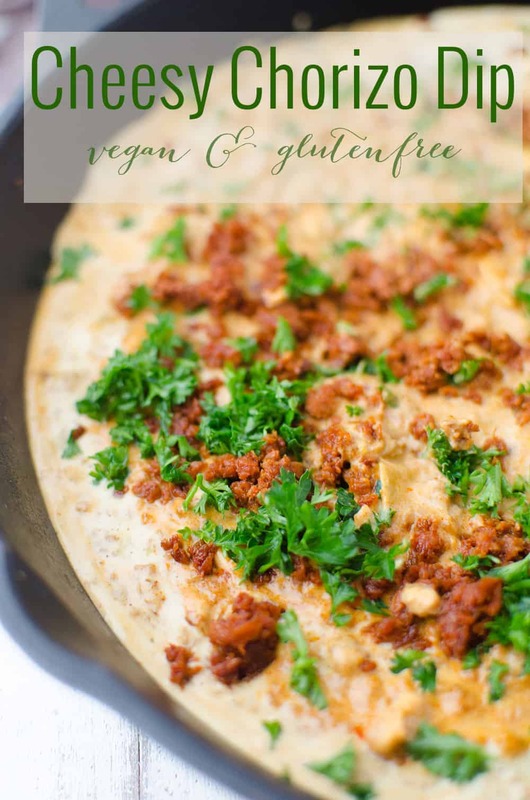 I spent about 2 minutes questioning how chorizo can be vegan just by your title and wow. You guys have the best products up there! This looks delicious, and I’ll have to temporarily de-vgeanise it! Gorgeous pictures! Ha! I know, it’s such a weird product. I actually only rarely buy it because its so processed but it tastes JUST like crumbled chorizo! You did it AGAIN! I love your vegan cheese dips. Seriously cannot wait to try this!! Surprisingly enough, I am “that girl” who loves sports as much as my guy — if not more! At least it means we aren’t fighting over the remote! And holy moly, I should’ve offered to trade you baked goodies for all of your recipes… This dip looks incredible! Pinned! Ha! Your coffee cake was INCREDIBLE! I had to fight with BL for the last piece! I am so glad that you love sports, I really try to be that girl! I just can’t do it 🙂 Thanks for sharing!